Elaborate studies have confirmed that many compressor systems are wasteful and inefficient. The inefficiency generally occurs in times of high demands, which emerge in irregular intervals. This places a heavy burden on the business as well as the environment. The solution to this problem lies in the frequency control. The RSF compressor is an upgrade of the successful RS compressor range and has a built-in frequency controller. 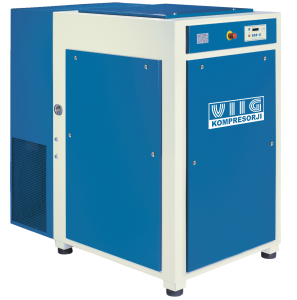 This allows the compressor to continuously adapt to the current demand for compressed air. Thanks to state-of-the-art electronics, the compressor runs at its optimal efficiency. This, in turn, reduces the costs and increases the performance. One of them is the analogue method, which is simple and practical. It allows basic control over the operating temperature and pressure and the number of operating hours. The control panel also has an emergency shut-off button. The other method is digital. Here, a digital control panel with a display is used to set various operation settings, which enables optimum operation at the highest possible level of efficiency. Digital control allows the compressor to continuously adjust its operation to the current conditions, which reduces operating costs and increases the overall performance. The user interface is also available in Slovene.